The names of the participants (from left to right): Nicola, Gwen, Elina, Gianni, Valentina, and John. This is a bit of an unusual entry for the blog, but I made a wager with Morrus of EN World (EN WORLD FORUM) that Clara in the current season of Doctor Who would turn out to be CAL from Silence in the Library. I was wrong and Morrus was right, she is not CAL. We’ve been working hard on our latest project: Sertorius. This is our fantasy setting that takes the core mechanics of the Network System and pushes them to the limit with a robust selection of magic, monsters and gods. In Sertorius players assume the role of powerful spell-casters who can channel divine energy taken from a slain god. It is a complete world, with an entire continent of races and empires. Today I want to give you a glimpse of one of my favorite places: The Mandaru Empire. The Mandaru are elven steppe nomads. They are one of a group of pastoral tribes in the region, and a large number of settled elves also live on the periphery of their grazing land. The nomadic tribes are organized around warrior bands. That doesn't mean most Mandaru are warriors, in fact few are, but fighting men and women are the elites and have greater authority than other members of the tribes. Usually they are not much of a threat to neighboring settlements, perhaps making the occasional raid. But sometimes they unite around a single leader, and in the last fifty or so years, the elves of Mandaru pledged their loyalty to Veja Kashan. Veja expanded Mandaru influence far beyond the steppes, forging critical alliances and taking key cities. The result was the Mandaru Empire, which stretches far across the eastern lands of Gamandria (the world on which Sertorius is set). The woman in the image is Vetanna Khusat, the emperor’s daughter and a queen of her own region. I want to explore the image a bit to introduce readers to our elves. First it is important to know this is a single highborn elf from one place on the map. There are lots of elves throughout the world and they are all quite different. However they have a few things in common. In a moment I will address those common characteristics, but first I want to talk about Vetanna and the Mandaru. Like her father she has her own band of warriors that form her power-base, these are called a Benkrob. The leader of a warrior band is usually a chieftain (called a Khan) and each chieftain is pledged to one of four Kings or Queens (called Khusats). Vetanna is the Queen (or Khusat) of western Mandaru. All the kings and queens pledge their allegiance to the emperor (or Kashan). Like all elves, Vetanna is immortal. Customs vary from place to place, but the Mandaru believe warriors who die in battle are born into the realm of their goddess Ranua (a kind of nature deity), whereas farmers and craftsmen are simply reborn as humans, dwarves or halflings. They also believe that the bond with their fellow warriors and their leader carries over to the next life. As you can see in the image, Vetanna is clasping a skull goblet in her left hand. When Mandaru leaders defeat a worthy opponent, they use the skull as a drinking vessel. Here she is holding court in her tent with her fellow warriors, following a recent conquest. The throne is made from wood shaped like tree branches. If you look at her face you can see a scar, which is quite common for elves. They are beings of beauty, but this is often marred by battle scars and lost limbs. They live a long time and can aquire many of these over time. The gold leaf tattoo on her forehead is common among the Mandaru and indicates her status. Her's is a three layer leaf, signifying she is a Khusat (Khans have two, normal warriors have one). The dots represent important military victories. Though it is concealed by her clothing, Vetanna is wearing lamellar armor. The blue flowers at her throne's base are blue water flowers, which are sacred to Ranua. In addition to it's sacred status, it's common in a warrior tent because it can be used to ward off infection (not to mention vampires). We have tried to make the elves a bit different but familiar. Elves are tall, athletic, and immortal.All elves were created by the nature goddess Ranua as a gift to the ogres (who once rules a powerful civilization). They were sent there as slaves and functioned as administrators and scribes for centuries before being liberated shortly before the ogre kingdoms fell. Their immortality made them especially skilled record keepers. Migrating south, they settled many lands and one of these was Mandaru. Most elven cultures are war-like, despite their immortality. Almost without exception they believe in rebirth, and for them death in battle is the only way to ensure prosperity in the next life. The Mandaru are unafraid of an early death in war, but other elven cultures fear this more than anything, reserving soldiery for elves who reach a certain age. They are still martial, but only those who have heard the ‘call of Ranua’ are expected to do the fighting. For them, the loss of an elven life before then is the greatest tragedy. This image was made by Samantha Fanti and is one of many to come to help us preview the setting. I should point out, if it does appear in our final book, in the printed version it will be black and white (since we don't print interior color images). Arrows of Indra is an RPG based on the original and most popular fantasy roleplaying rules; for old-school heroic fantasy adventure in a world that is exotic and at the same time highly recognizable, Inspired by the Epic Myths of India during the Age of Heroes. Players take on the roles of brave Kshatriya warriors, disciplined yogis, temple priests, rogues or scouts, assassins of the dark goddess, magic-using Siddhis seeking the mysteries of the universe, playing humans civilized or barbaric, immortal Gandharvas or Yakshas, Vanara monkey-men or half-demonic Rakshasa; and adventure in Naga-filled jungles, fight Asura demons, visit the ruins of ancient Rakshasa empires, seek out the shining treasures of the truly massive Patala Underworld, fight duels for money or honor in the Kalari Arenas, or get caught up in the political and military intrigues of the human Bharata Kingdoms. It’s the same heroic adventuring you know and love, but with a new and exciting environment. 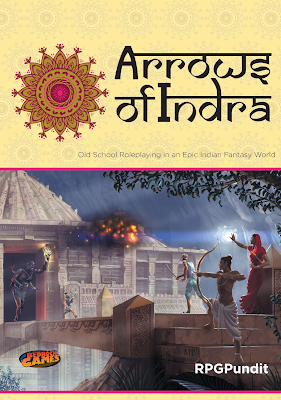 No anthropology, history, theology or linguistics degree required; everything you need to play heroic characters and adventure in the Bharata kingdoms is found right here in this book! The Bungalow of the Beach Giant Chiefs!